What about a nice and cozy Brunch with your Erasmus friends before your christmas holidays and leaving back home? Study time and exams are exhausting that's why you should take time for filling up your energy! 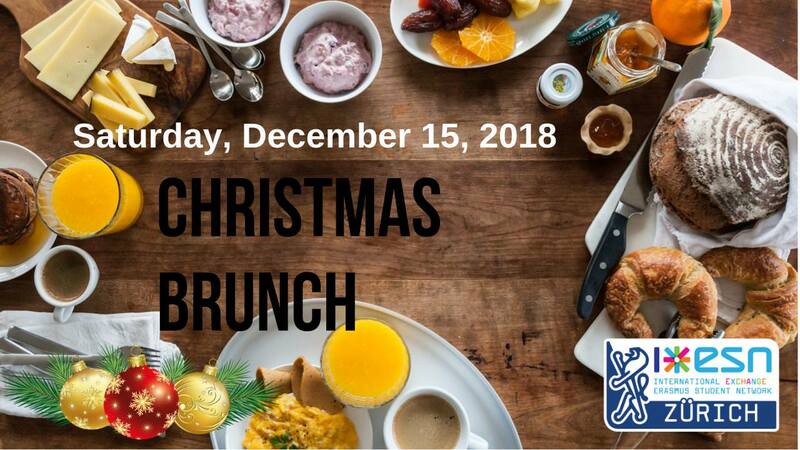 ESN is organizing a Christmas Brunch at UZH Cafeteria (Brunch is organized by UZH and open to public). We meet at 10;00 at the lower UZH Cafeteria, so you can be amongst the first to hit the buffet. Open-End, it is closing at 1pm. For those who want to go to the Crazy Countdown Milan we can together catch the train at 1pm and be there early evening !! Wie wärs mit einem netten gemütlichen Brunch mit deinen Erasmus Freunden bevor du in die Weihnachts-Ferien und zurück nach Hause gehst? Lernzeit und Prüfungen sind streng, darum solltest du Zeit nehmen und deine Energie frisch füllen! ESN organisiert einen Weihnachts-Brunch in der UZH Mensa (organisiert durch UZH Mensa und öffentlich). Wir treffen uns um 10 Ihr bei der Unteren Mensa UZH Zentrum, so bist du bei den Ersten die sich ins Buffet stürzen. Open-End, Mensa schliesst um 13 Uhr. Max. Participants 15 -> Registration is necessary. You need to provide your Students-Card and ESNcard at the event.